My day starts out at 5:30 am when Wylie and I go out and get the newspaper. We then walk over to the coop and wake up the rooster when we open the door to the run. We go back to the house, Wylie goes back to bed, but I stay up. It’s around 7:30 when I head back out to feed and clean up the coop. 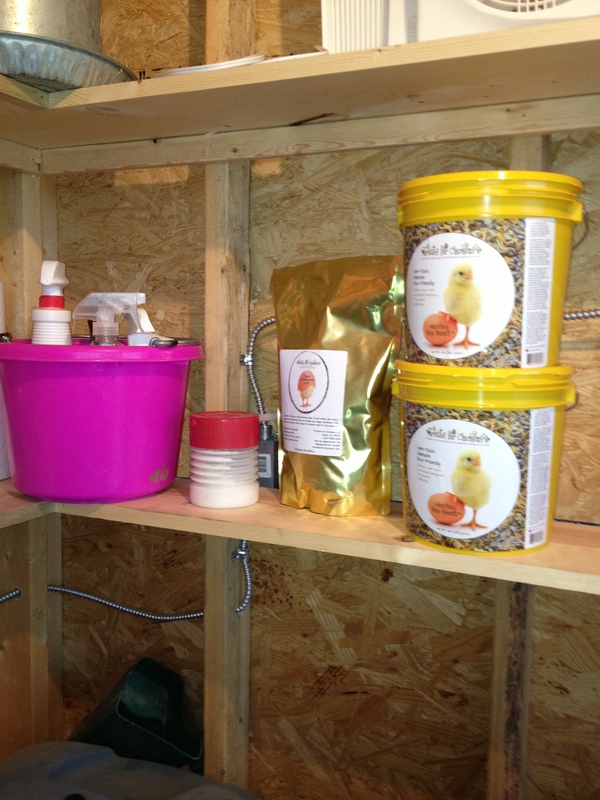 The feed room is the first room you walk into when entering the coop. I store the layer and scratch grain in the large blue containers. The small green containers hold the grit and oyster shell. The chicken treats of mealworms are in the little pink bag. In the far pink bucket are my cleaning supplies. 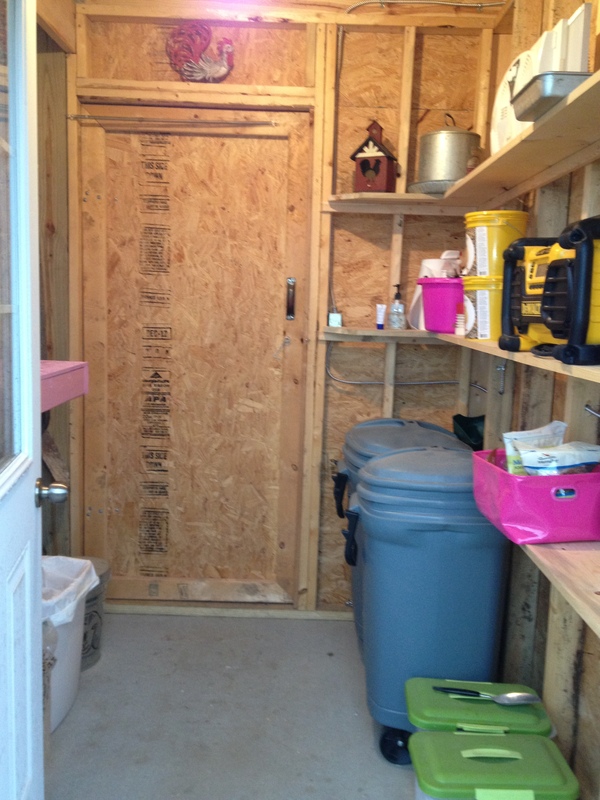 Another view of the feed room. 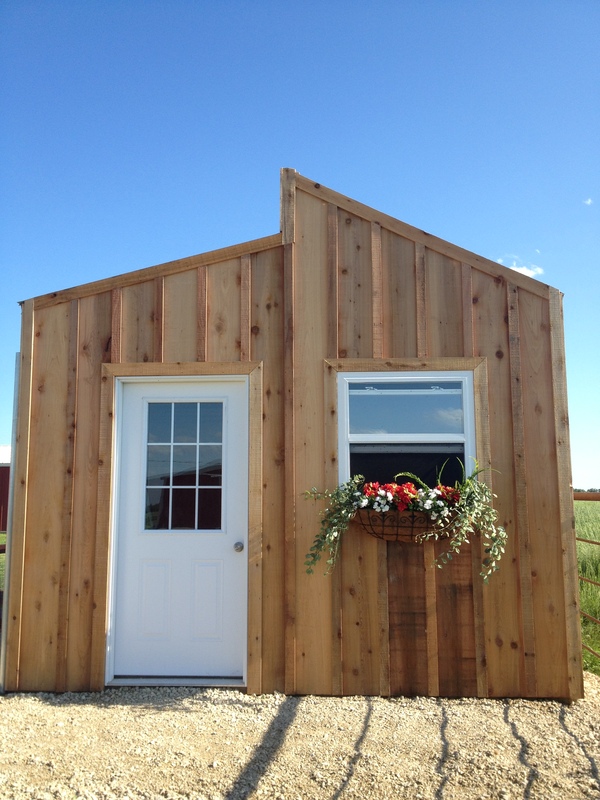 I use pine and cedar chip for the coop floor. It’s easier than raking up straw and of course the pine and cedar smell so good. One of my favorite products is Nesting Box Blend. 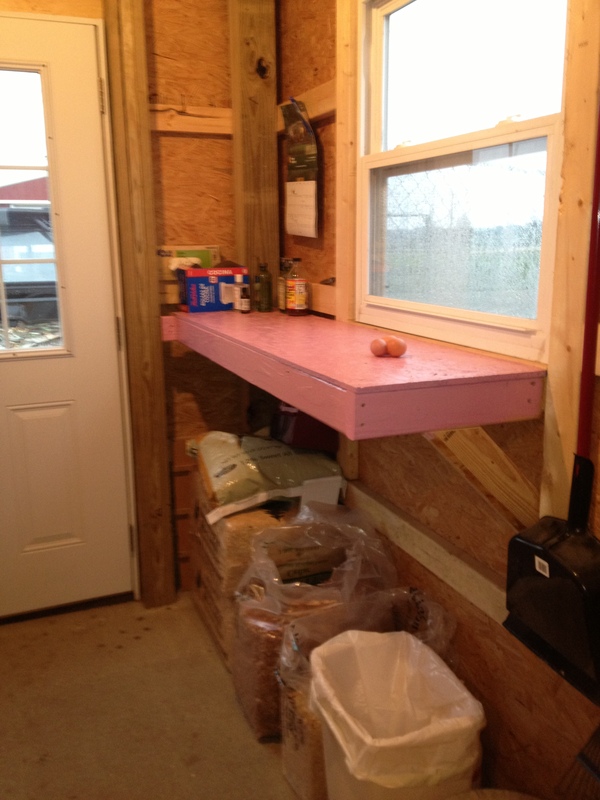 I add it to the nesting boxes and sprinkle some on the floor. It contains lavender, chamomile, bay leaves, eucalyptus leaves, oregano, peppermint, tansy, wormwood, marigold petals, spearmint and catnip. It repells pest and is an anti-mite preventive. It wards off bugs, is also antifungal, antiseptic, soothing and healing. It’s no wonder I am relaxed and calm after I clean the coop! I get the nesting box blend from a company called “Treats for Chickens”. 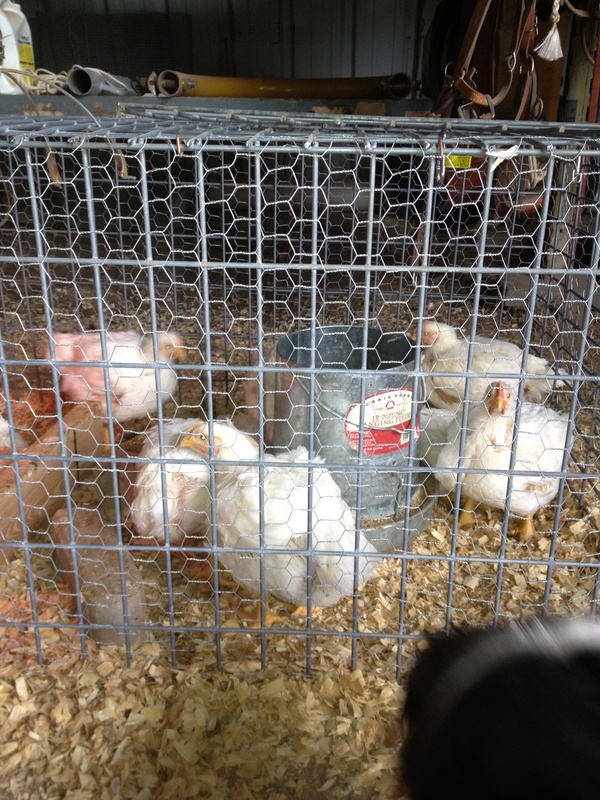 They have a lot of other products that the girls love such as Chicken Crack and Worms and Harvest Flakes. These are some of the products that I use daily. For fly control, I use a mixture of Melaleuca products, 1 tsp of Tough and Tender, 1 tsp of Renew Bath Oil, and 10 drops of T36-C5 Melaleuca Oil (tea tree oil). 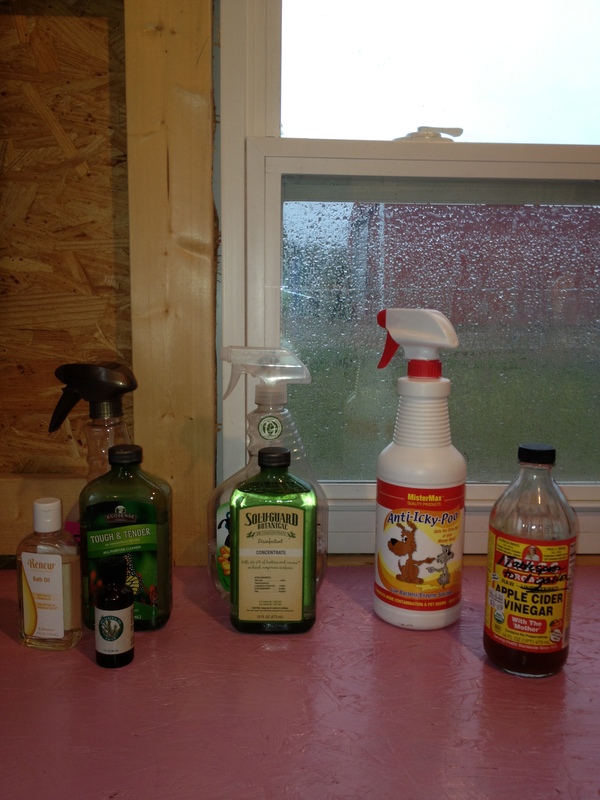 I disinfect the walls and roost daily with Sol-U-Guard, another Melaleuca product. Anti-Icky-Poo is a great odor control. It is a live bacteria to eliminate any organic bacteria. Anti-Icky-Poo’s friendly microbes eats away the source of odor and eliminates the problem from returning. I also put apple cider vinegar in their water. ACV causes an alkaline effect which reduces the likelihood of illness and helps to support the immune system. I enjoy using these products and they are all safe for the environment and pets, and they really, really work! If you are interested in Melaleuca, let me know as I can get you in touch with some wonderful people who would be more than happy to help you get starting with Melaleuca. 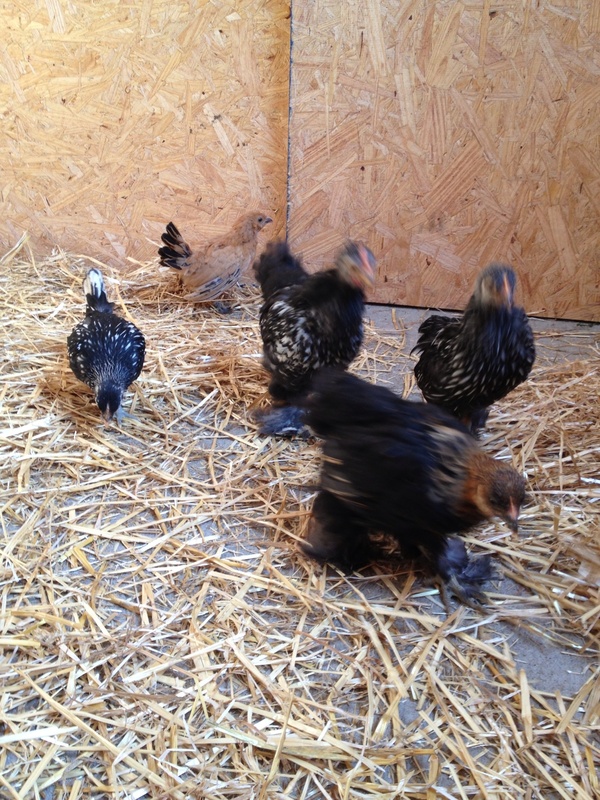 I have a lot of help, or maybe they are inspecting the coop to see that I am doing a good job. 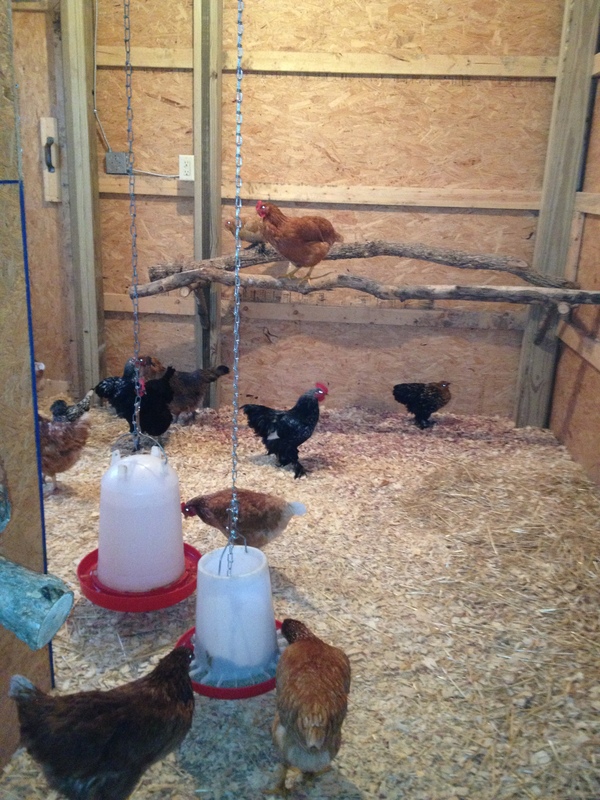 I love the pine roost that Jack, my interior coop designer built for them. Another pine roost and the nesting boxes. I have a whole wall full of boxes, but we only have 3 open as you only need 1 box per 5 birds. Blocking them off keeps the chickens out of them, so I don’t have to clean them up! 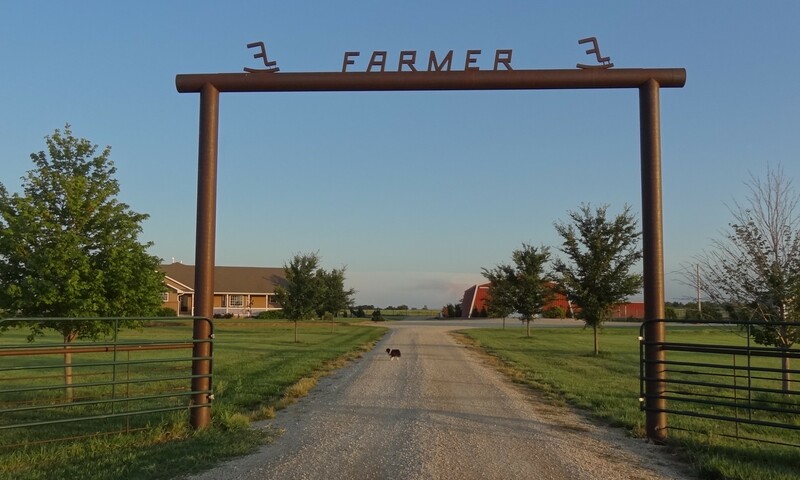 This entry was posted in Daily Happenings, On The Farm and tagged Bantams, Chickens, coop, farm on July 28, 2013 by Debra Farmer. 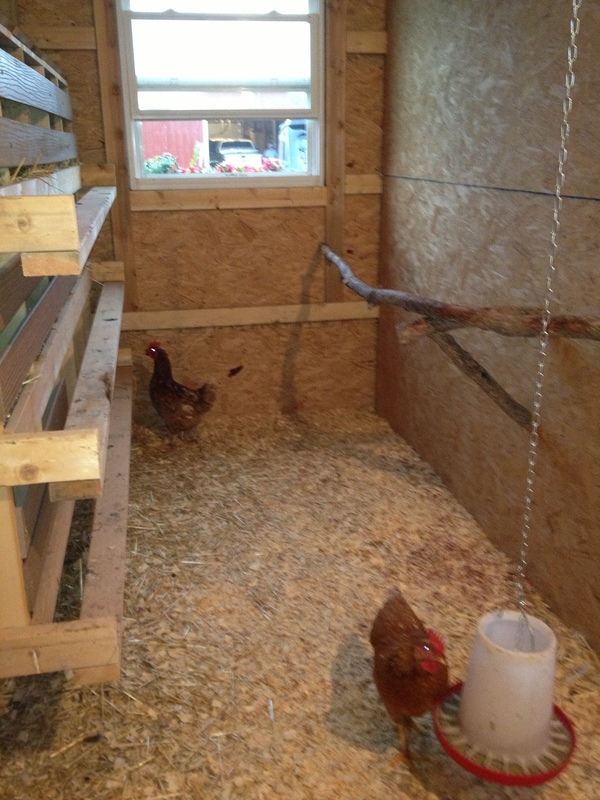 The little bantams were the first to move into the new coop. When I moved the larger Red hens, there were a few battles. Wylie even got involved in some and got pecked on his nose. Wylie keeps his flock together. 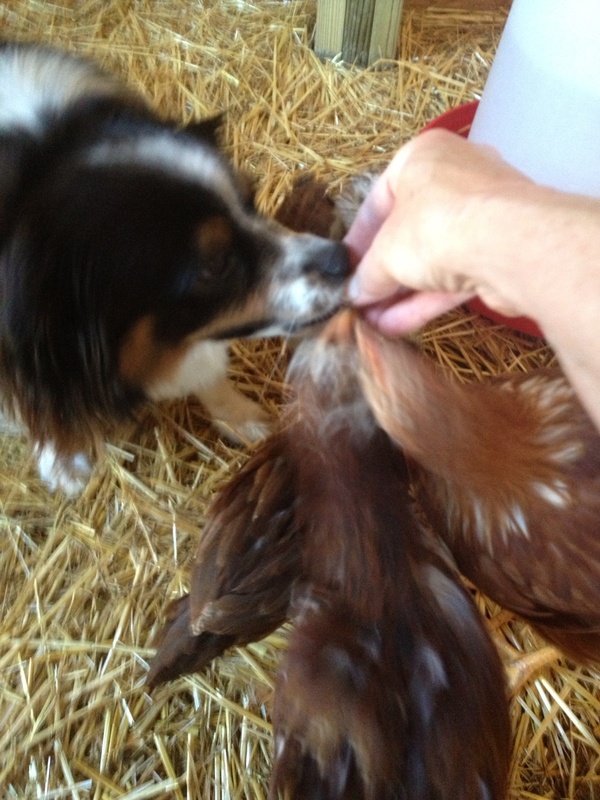 Wylie enjoys when it’s treat time for the chickens. I didn’t know he liked lettuce! All of the chickens will take the treats from my hand. The chickens (not Wylie) especially enjoy meal worms and the earthworms. The crew building the fence for the coop will be here next week. 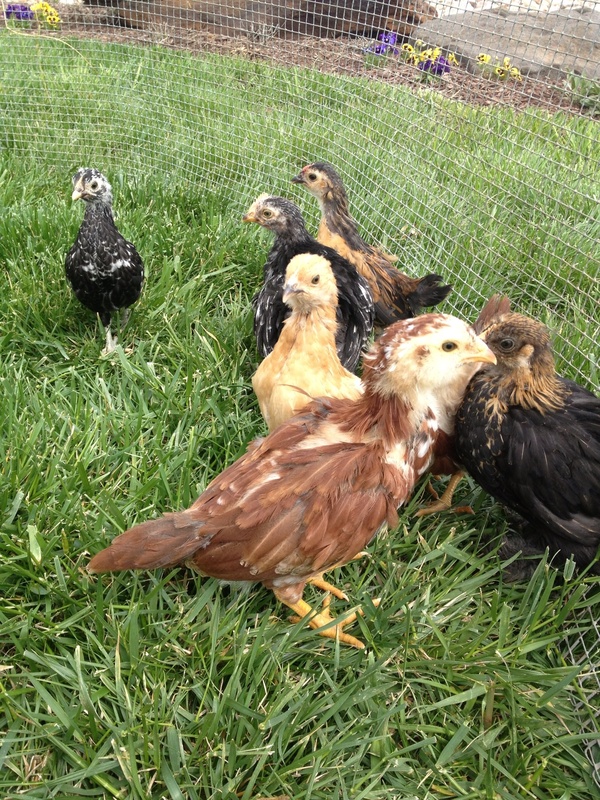 The bantams are the only ones that I let free range. Wylie keeps a close watch over them. 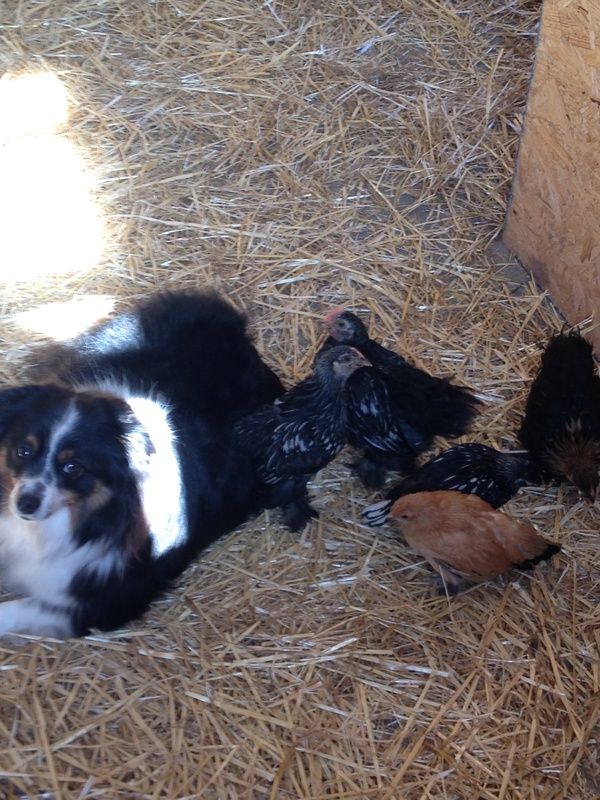 This entry was posted in Daily Happenings, On The Farm and tagged Bantams, Chickens, coop, Toy Australian Shepherd, Wylie on May 14, 2013 by Debra Farmer. The weather has been so unusual, and it has caused some delays in the building schedule. We are hopeful that the Coop de Ville will be built this week. We butchered the meat birds last weekend, it was amazing how fast they grew compared to the little laying hens. The WhizBang Chicken plucker made the job so much easier, if you want to know more about it they have a video on YouTube. I haven’t ate chicken in years, and I must say ours are delicious. The afternoon was beautiful and everyone enjoyed being out. 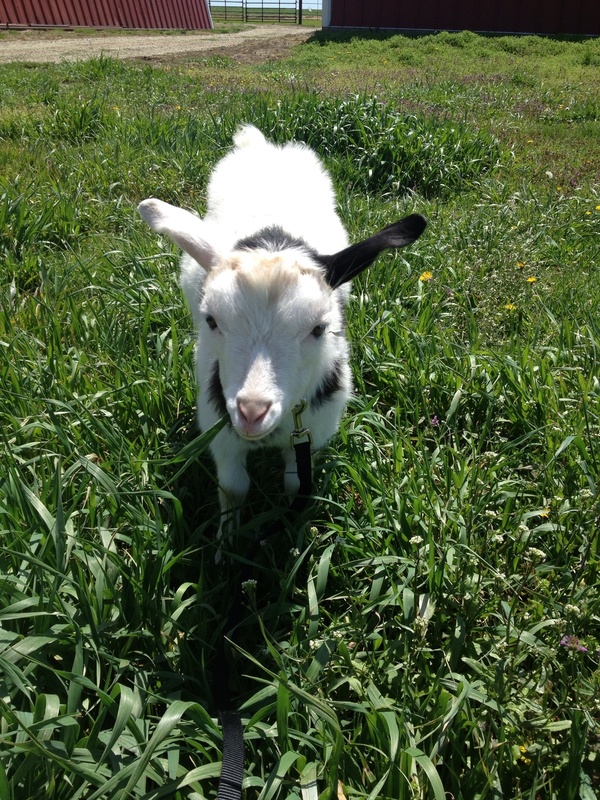 William enjoys being out. I would of had Bill out too, but I can’t catch him, he isn’t as easy to catch as fainting William. 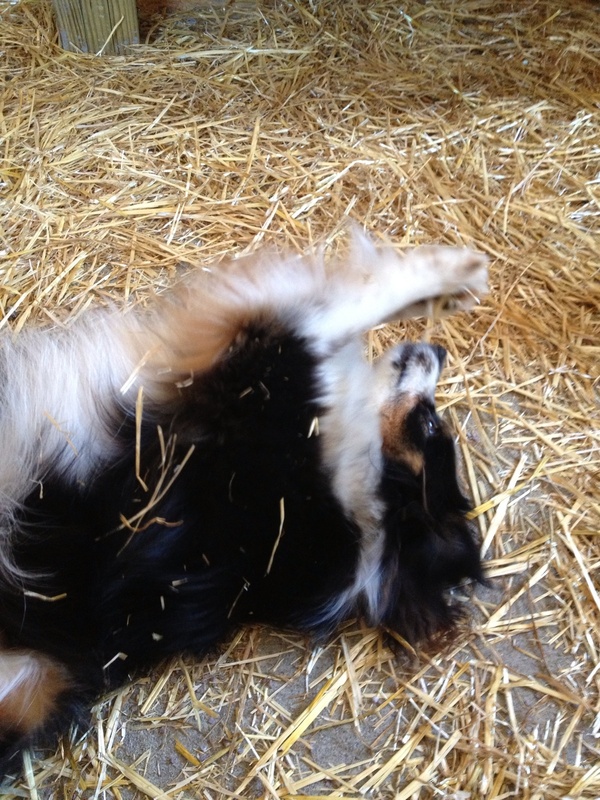 This entry was posted in Daily Happenings, On The Farm and tagged Bantams, Fainting Goat, Toy Australian Shepherd, Wylie on May 5, 2013 by Debra Farmer. 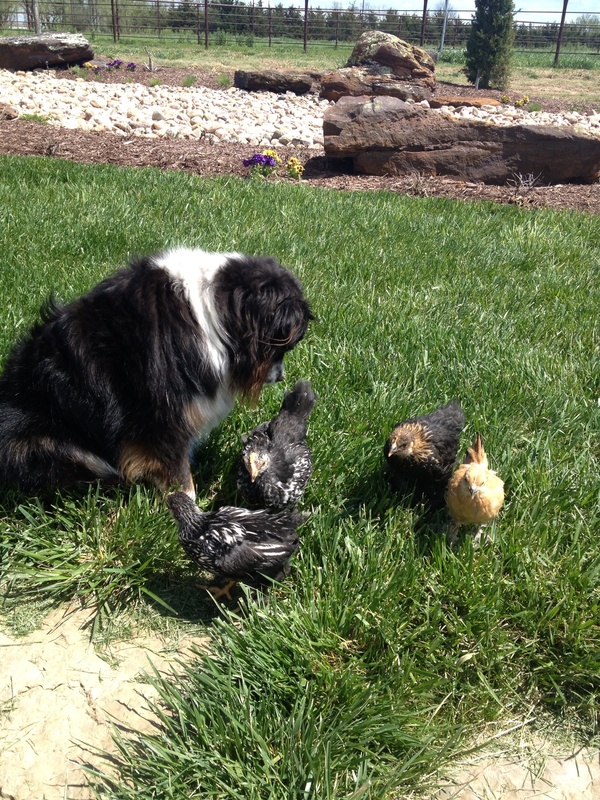 Wylie is practicing his herding skills on the little Bantams, but I really wonder who is herding who?!? The construction material is the coop de ville, hopefully the weather will cooperate this week and they can get the coop built! 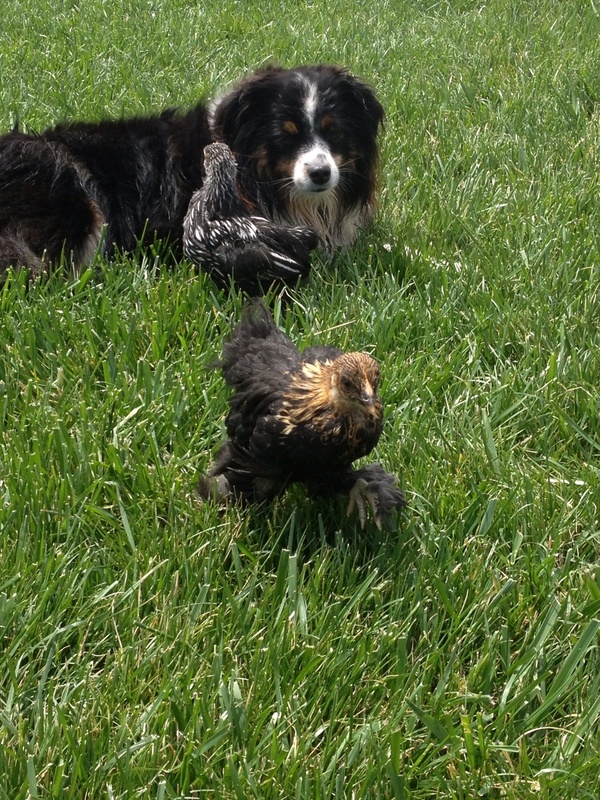 This entry was posted in Daily Happenings, On The Farm and tagged Bantams, Chickens, Toy Australian Shepherd, Wylie on April 28, 2013 by Debra Farmer. These are our meat birds. I can’t believe how fast they grow. Husband is busy gettingtheWhizBangchickenplucker finished up. 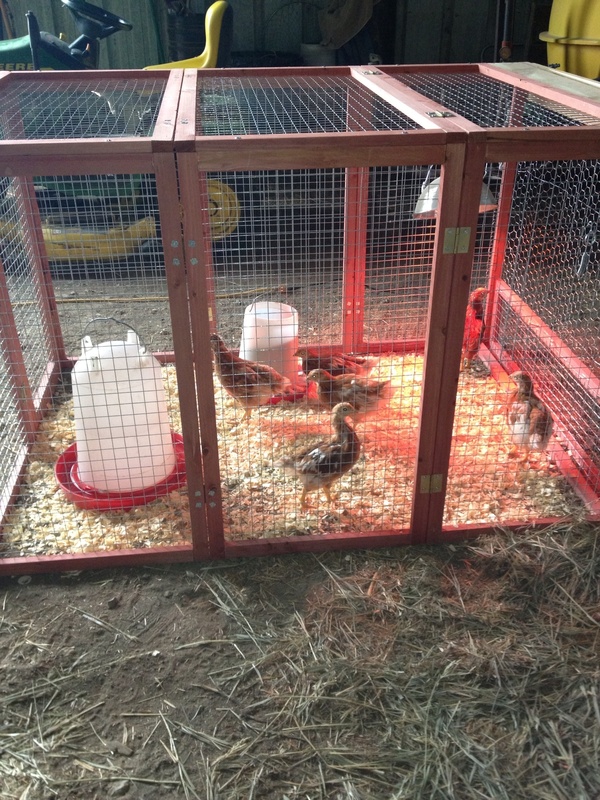 I hope they get the coop built soon so they can enjoy a few days/weeks in their new home, before they take a ride intheWhizBang. 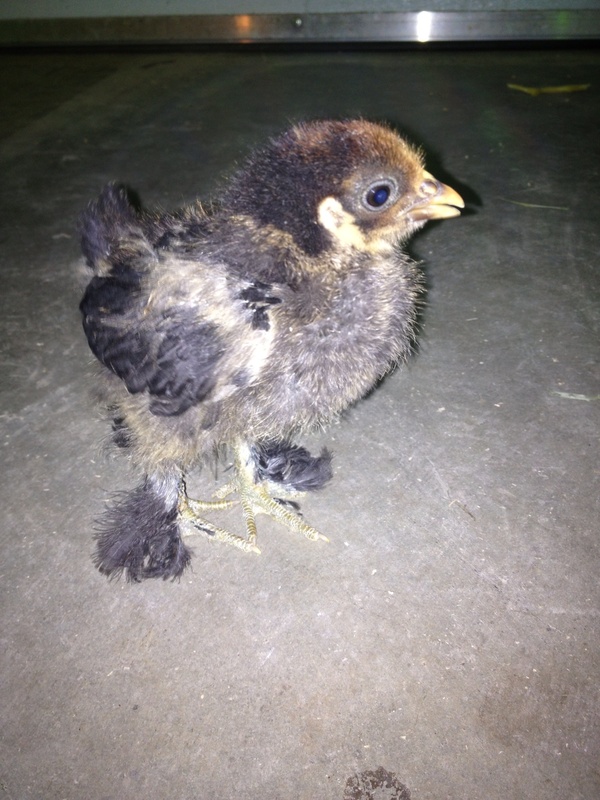 Our Reds are the same age as the meat birds, 5 weeks old. 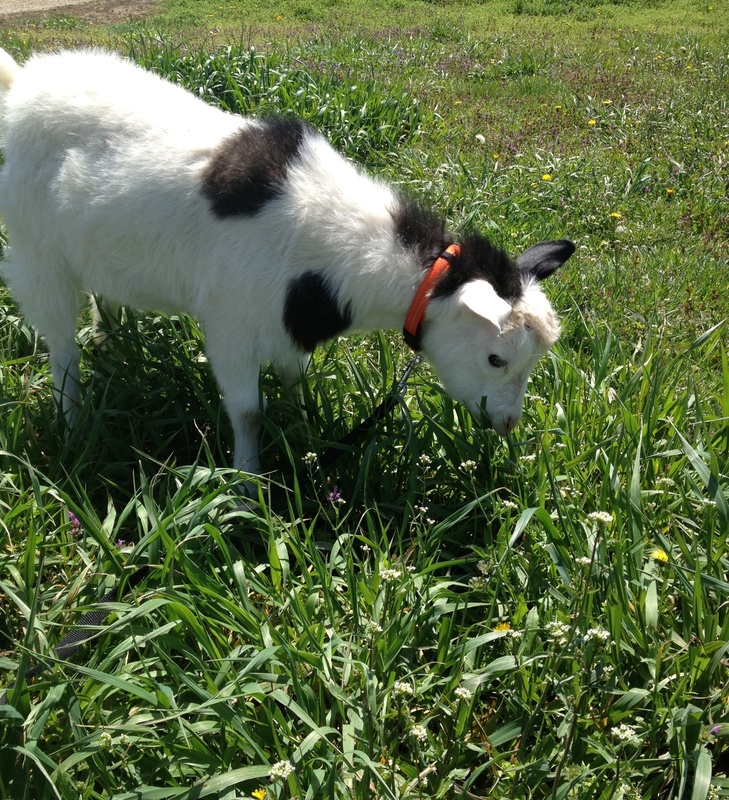 They are a very docile breed and like attention. This is one of the 6 Bantams. They are 2 weeks old now. Such a big attitude for a little bird. We also have 7 Buffs that are the same age. 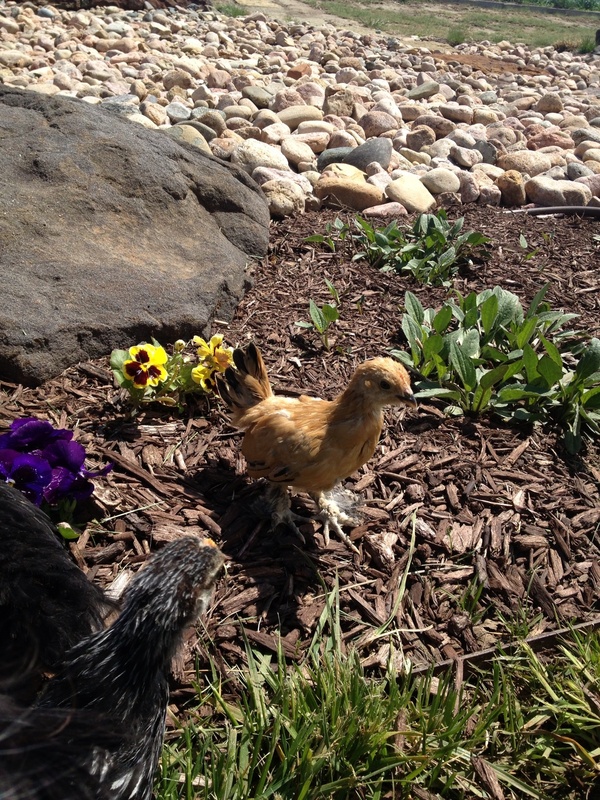 This entry was posted in Daily Happenings, On The Farm and tagged Bantams, Chickens on April 18, 2013 by Debra Farmer.